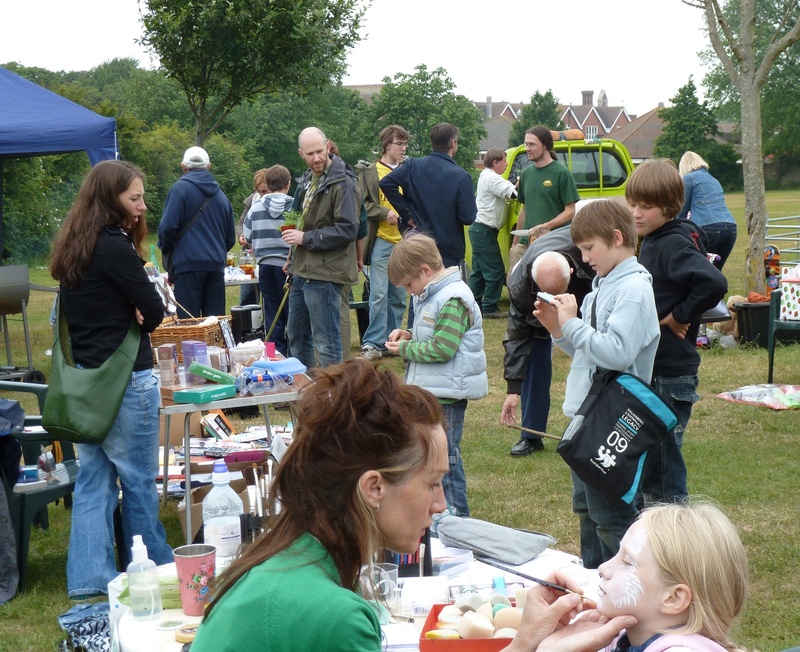 Ably supported by our Park Ranger, Garry Meyer, and two of his colleagues, Friends of Dyke Road Park put on a delightfully friendly and relaxed event on the field at the park on Bank Holiday Monday. 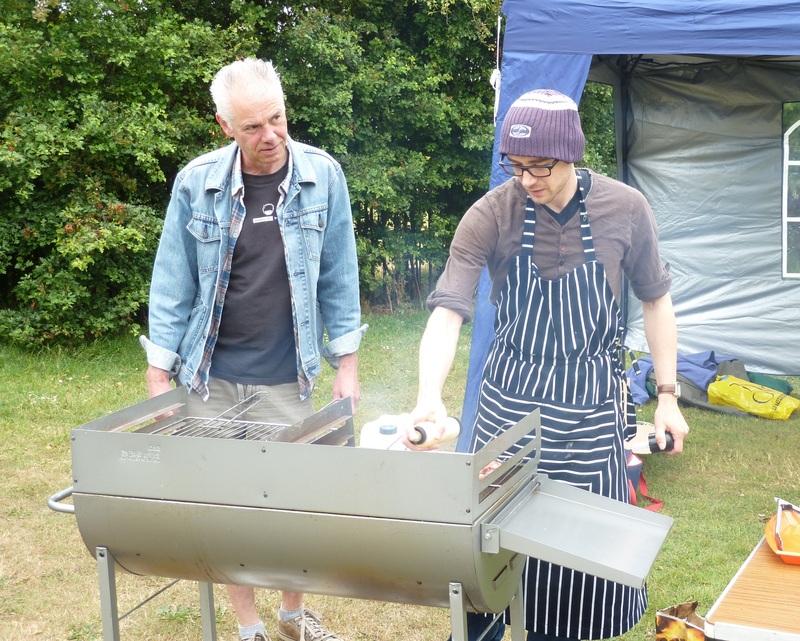 There was delicious local lamb and other food on the barbecue, well-stocked cake, plant, bric-a-brac and book stalls, and an indefatigable face painter who kept going without a break from beginning to end. What more could you want? 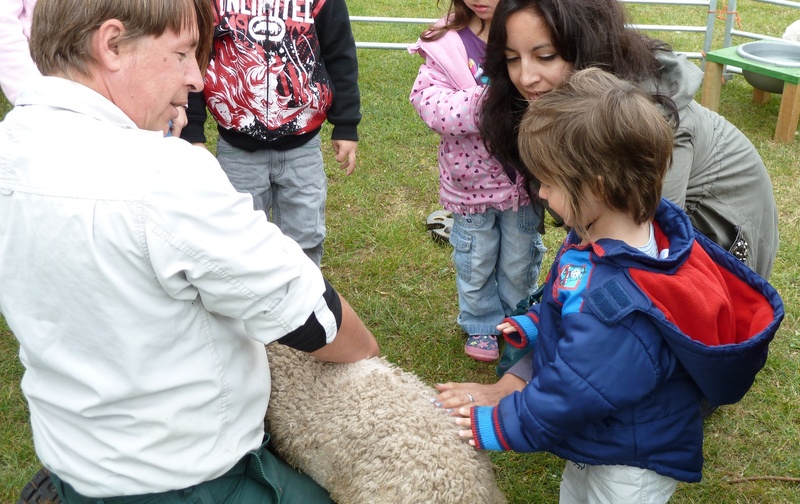 Well, the live lambs, brought by Garry from the flock he helps to manage on the outskirts of Brighton http://www.brighton-hove.gov.uk/index.cfm?request=c1210514 proved the star draw, with opportunities for children to stroke them, and find out all about their bodily functions… A definite hit! Many thanks to all those who made it possible. The next PCA committee meeting will be on Thursday 9 June at 8pm. All welcome as usual; please phone 509653 for details if you’d like to come along. If there’s anything you’d like discussed, please post a comment below by Friday 3 June and we’ll put it on the agenda. There was another successful work day on Saturday. 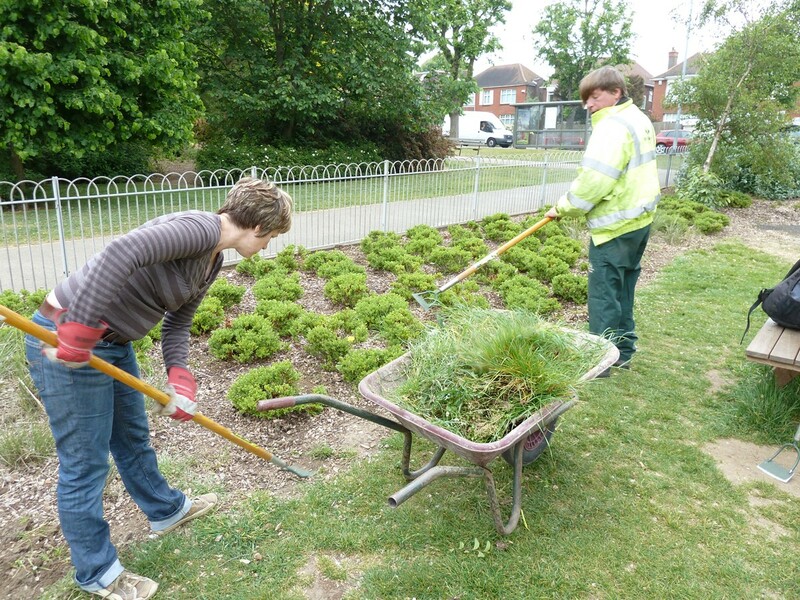 Although not as well attended as last month’s, those of us there managed to weed the border in the children’s play area (well, we hope all the plants we removed were weeds…) and cut back a large shrub that was impeding the path round to the bowling green. We look forward to seeing more people on Saturday 18 June, 10.30 outside the cafe. 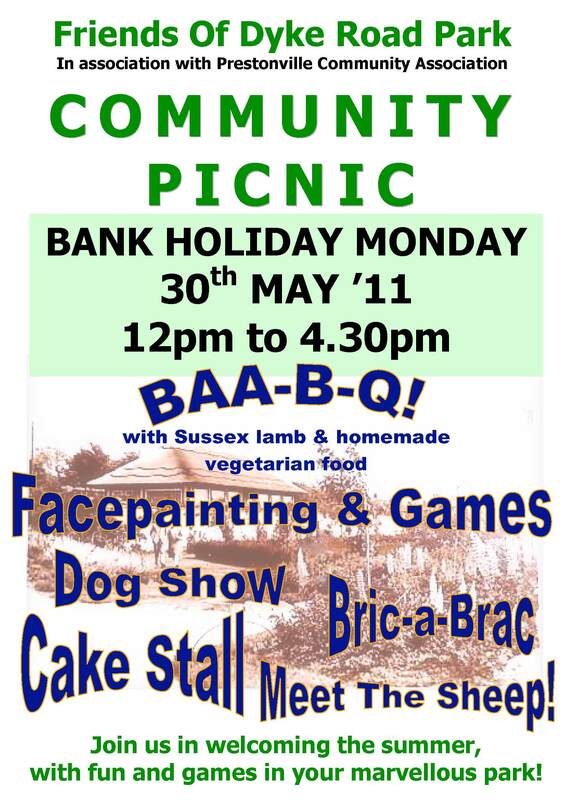 Don’t miss this community event on Bank Holiday Monday, 30 May, 12 noon onwards. On 6 May our Park Ranger, Garry Meyer, and several Friends of Dyke Road Park, set up tent next to the tennis court, on the route down from Tesco into the park. Armed with litter-pickers, bright-green bin bags and tabards, we tried to enthuse people about the benefits of keeping the park free of litter. We were joined at lunchtime by 15 young students from Cardinal Newman School, and two of their teachers, who worked hard for over an hour. They were rewarded by various goodies donated by Tesco – who themselves sent two staff members to help pick litter. The exercise was useful in bringing to the attention of both Tesco and the school the scale of the problem of litter in the park. By the end of the 4-hour session the park was completely litter-free, with litter collected from inside bushes as well as from open areas. We are very much hoping that this positive action by so many volunteers will have some impact on the attitude of all park users towards litter. The exercise will be repeated in a month or so. We now have two new councillors in Preston Park ward, Leo Littman and Mike Jones, who took the seats held by Labour’s Kevin Allen and Juliet McCaffery in the election on May 5. They join the existing Green councillor, Amy Kennedy. The PCA has always worked closely with local councillors, and we look forward to meeting our new representatives. We are also very grateful to Kevin and Juliet for their help, support and guidance over the years; their commitment to the Prestonville community is greatly appreciated.